As I cannot fix anything into the walls of the studio I borrow some easels to display my work . I think about how work is displayed in the castle and go for a layered approach. I lay out all the watercolours on a table on acid free paper. 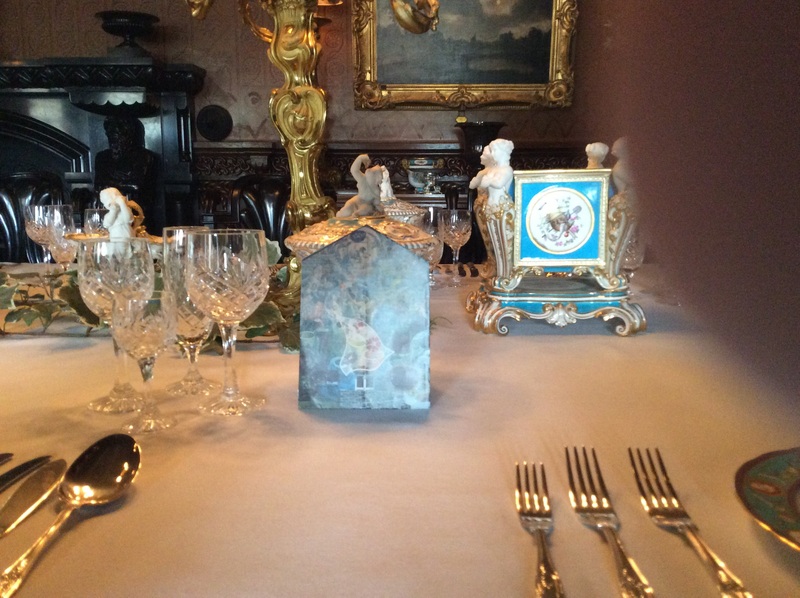 The oil paintings are on easels or in alcoves. I use a cupboard in the studio to display cut outs, drawings and source materials. The opening works well with lots of staff and volunteers. After this we drink wine, order take out pizzas to the castle ( a first) and play charades until 3.3o am. The following day there is a meeting with the trust and a steering group for the residencies; despite the artists’ hangovers it goes very well and everybody is very positive with what has been achieved. The following day we all pack up, it is a little sad. The good news is that we will be back in the castle in the autumn as the National Trust want to organise a more public showing at the castle of the work made… so watch this space. On a final note I want to post an image and text from volunteer Janet. If any more volunteers or readers want to send me their choices of what you would want to put in the castle, where and why e mail me with an image at emrys.w@ntlworld.com and I will add it to this post. Janet wrote; Regrettably it isn’t in my possession. However I’d love to place a copy, or better still the original, of this slate carving, probably made by a quarryman from Dyffryn Ogwen, above the fireplace in the dining room at Penrhyn Castle. I could then imagine the horror of George Sholto if he could come back as a spirit and see it there. I’m sure his reaction would be even more dramatic than that of anyone who happened to see his ghost! Today it was all systems go for the three artists. It feels like the final stage of the residency.It has been a busy day and I it is late so I am not going to write much. We have an event for the volunteers and staff tomorrow. 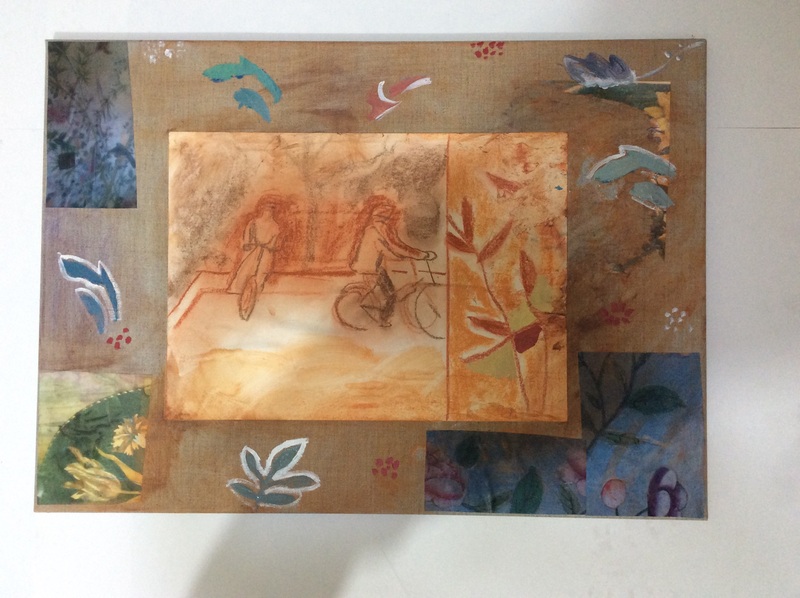 I made two larger pieces today using collage, different variations of the cycling image. 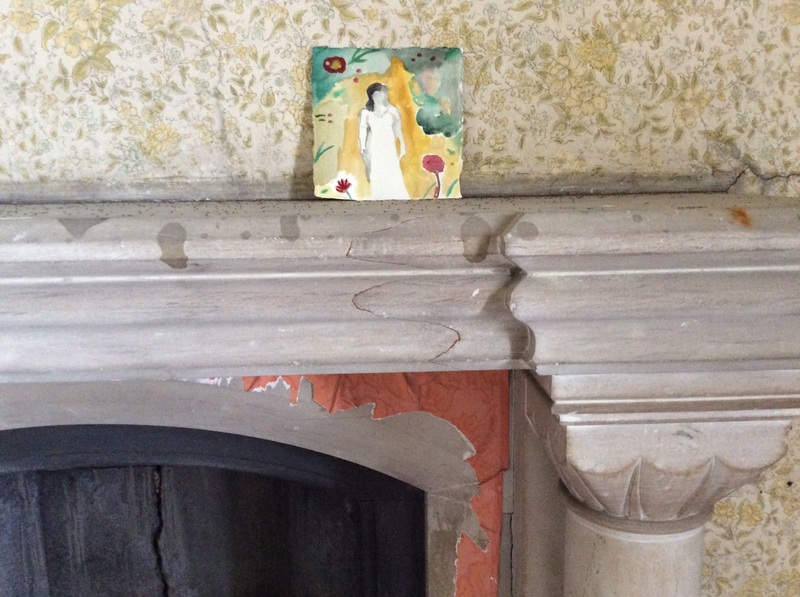 Following on from the last act of art intervention in the dining room I decided to play with installing some of my own works in the Keep.Part of this section of the house is bare brick and is only open to the public on mini tours. Having worked with cunning and stealth with the Joy intervention I decided to follow the correct channels on this next experiment .I got permission and part of the time I was accompanied by Alec, we shared a walkie talkies , it was safety in numbers ! The Keep is off-road territory in castle culture. I had always planned to explore putting artwork in this area and I was interested in how my faded wallpaper aesthetic would work in the spaces. I liked the relationships of scale, pattern and material I found in placing the works. Today I explored placing work in the castle. 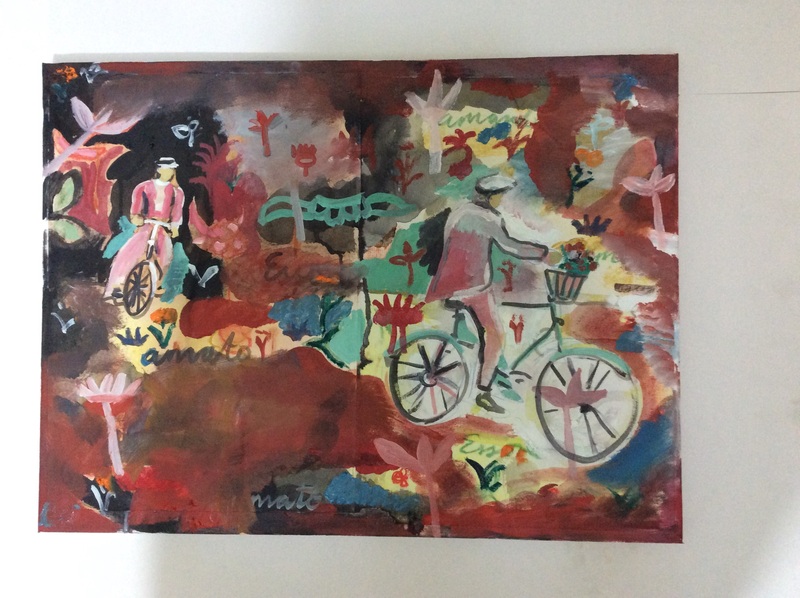 I made a copy on the item Joy had chosen, an image of an Ed Povey mural on a wall; before the castle had opened I placed the image in the first and then second place she had considered; below stairs in the kitchen and then on the dining table upstairs. This was an act of art terrorism in terms of the castle but it needed to be done and I was very careful. I liked the whole concept and rationale Joy presented; it is interesting the way the image of the mural sits nicely on the dinner table. It’s a quiet revolution by most peoples standards but radical for Penrhyn, frozen in time. I hope Joy is happy with the result.